What takes 2-3 hours each day now can be done in Several Minutes. Real $avings! 3 Easy Steps to Convert Paper Forms to Mobile Forms. No Tech or Programming Skills Needed! Today mobile technology is the first trend in business and if you ignore it you risk being left behind while your competitors surge ahead. Many users believe that the main advantage of business applications is the improvement of productivity and costs reduction. However, Telstra research shows a whopping 75% of small businesses are still reliant on traditional paper-based tools, spending an estimated $608 million a year on paper. And although there are many business apps for smartphones and tablets, only 24% of small businesses are using them in the workplace. However, business applications and mobile forms are unique benefits for any business. They can help you easily automate manual processes, support document sharing, process these documents on your mobile device, track tasks, create digital accounts, collect and conveniently store the data and others. Say goodbye to the paperwork! Use Mobile Forms! One of the main advantages of business applications is the reduction of paperwork. You no longer need to have the archives, check and parse them. All necessary documentation can be stored in mobile form format, and be available at anytime and anywhere. In addition, various functions such as e-signature, work with photos, location determination and automatic form filling do a lot of business processes easier and faster. While many companies offer only a small number of standard functions in mobile forms usage, Snappii has a great set of powerful unique features which made from your mobile form a complete business app. Mobile business apps and mobile forms are the new level of business management. Say goodbye to the paper forms. It’s time to finally free your workspace from excess paper, and your budget from extra expenses. A company with 8 employees saves $10000 a year going paperless and a company with 370 employees saves $1000000 a year going paperless. So, help your business, feel the benefit and go up with the times! Mobile forms can not only be filled out and sent from a mobile device, but also stored on it for future reference. In fact, mobile forms can be extended to mobile apps really quickly. The benefit from such extension is obvious. Mobile forms can be stored locally on device, found quickly, edited, resent, shared via cloud drives, and more. Mobile apps with your forms are always at hand as they are installed on your mobile device. Now you can create any mobile form yourself with the help of Snappii form editor. Simply open form editor and create your form adding the fields you need. All these functions are very useful, and in many cases are necessary for data collection, but they are not enough for the more serious and agile business processes. Snappii, a codeless rapid mobile app development company, offers Mobile Forms Solution which allows users to mobilize complete business processes and provides deeper unique features. 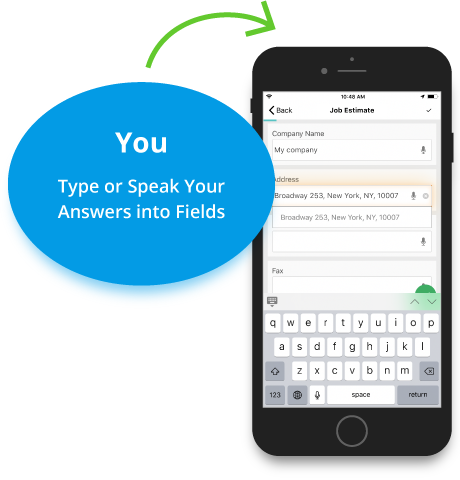 Our mobile forms eliminate the need for paper, reduce input errors and empower your organization. For example, nowadays you can easily use your existing PDF forms into the app just by uploading them and making necessary changes. Look at the screenshots of the Snappii My PDF Form Manager app to understand the principle. Mobile forms can fully substitute clip boards and paper forms. Just think how much space will be free if you replace your endless paper documents by one mobile device! It is very convenient to work with data in such form, given the unique advantages of mobile apps. For example, mobile data collection apps can accurately track the comings and goings of supplies just by scanning bar codes. The average worker goes through 10.000 pieces of paper a year. 85% of all incidents of identity theft occur via paper products (Max Blumen infographic). So, mobile forms contribute to the security of your data. Elimination of the delays of printing and shipping paper forms leads to the acceleration of workflow. Furthermore, it takes 18 minutes on average to find a paper document. So, go paperless, use mobile forms and save working time! Snappii offers not just mobile forms but powerful features-rich business apps which can please any industry. Collecting information in Snappii apps is not only achieved in real-time, but is accessible in real-time thanks to the cloud-based system. In addition to the collection and storage of data, we have a lot of other built-in features which you can use for your needs. With Snappii you do not have to be a programmer to mobilize your data collection process. When searching for the best mobile solution for your business, consider unique Snappii solutions, which will help you not just replace paperwork but mobilize business and take it to the next level. Let’s get started, absolutely free to try!